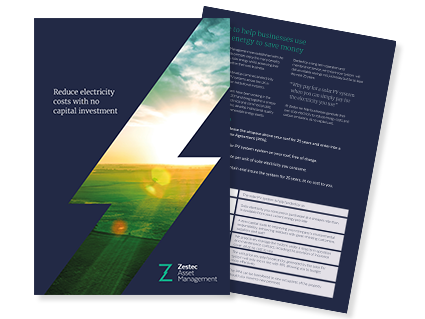 Zestec enables clients to achieve long term financial savings by generating their own clean, green electricity under a fully-funded, subsidy-free, solar photovoltaic (PV) Power Purchase Agreement (PPA) model. Clients not only benefit from reducing their carbon emissions, but are protected from long term energy price increases as the PPA is locked into retail price inflation. The system is fully funded by us. Solar electricity you consume is purchased at a rate cheaper than is available from your current energy provider. A zero capital route to improving your company’s environmental responsibility, enhancing relations with green thinking customers, suppliers and staff. We proactively manage the system under a long-term operation and maintenance contract, including provision of insurance cover, all at no cost to you. The unit price you pay for electricity generated by the solar PV system will only rise in line with RPI, allowing you to budget more effectively. The PPA can be transferred to new occupants of the property should you move to new premises. Zestec fully funds the entire installation of a solar PV system and you benefit by consuming the discounted solar electricity which is generated. After 25 years, ownership of the system transfers to you and you enjoy free solar electricity for the remaining life of the system (c. 10 years). *Based on a 250kWp system, 90% on-site usage, 12.289p/kWh electricity tariff, 9.0p/kWh PPA tariff, 2.5% RPI and 5.7% electricity price inflation.